Herbicide damage can resemble other tree problems such as branch dieback, foliage discoloration, and premature leaf or needle drop. Look for certain clues to help narrow down whether it is a weather related issue, insect or disease issue, or a potential herbicide issue. High-value ash tree at peak fall color. 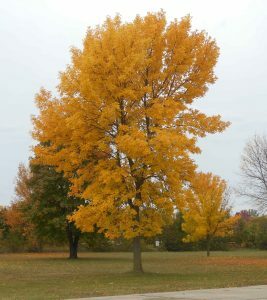 March is a good month to consider insecticide treatments for high-value ornamental ash trees this spring. Emerald ash borer (EAB) has been found in 42 Wisconsin counties and is expected to be more than 99% fatal to ash trees that are not protected with insecticide every 1-2 years. Many insecticides used in EAB treatments are applied between mid-April and mid-May, and now is a good time to contact a tree service or other pesticide application business if arranging for professional insecticide treatments. 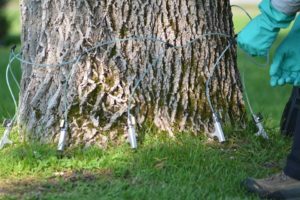 Property owners with susceptible ash trees should consider a number of factors when deciding to treat their ash trees, including financial cost, tree condition and location, the shade a tree provides, its contribution to property values, and aesthetic view. Homeowners should also consider the financial cost of removing a tree that is killed by EAB, and the benefits that a dead tree no longer provides. If you need to become a certified and licensed pesticide applicator, or you need to be recertified and licensed, read the information needed for the Department of Agriculture, Trade and Consumer Protection (DATCP) training. 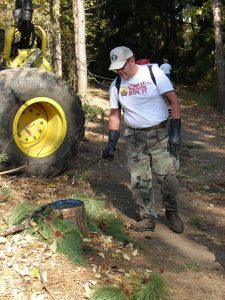 Applying a preventative treatment to a fresh pine stump using a backpack sprayer. Photo by: Linda Williams, WI DNR. There are currently two products available to treat fresh pine stumps to prevent new infections of heterobasidion root disease (HRD), which was previously called annosum. The products are Cellu-Treat and Rotstop-C. Both are water soluble and can be sprayed on the stump. Sporax, a granular/powder product, was previously available but is no longer being manufactured. If you still have a supply of Sporax you can continue to use it. The one-page factsheet on HRD (Annosum) has been updated with information on where to purchase the available products. Written by: Kyoko Scanlon, forest pathologist, Fitchburg (Kyoko.Scanlon@Wisconsin.gov), 608-275-3275. Over the course of several years of monitoring new plantings on landowner properties throughout the state, reforestation staff encountered a wide range of herbicide prescriptions, with varying results. 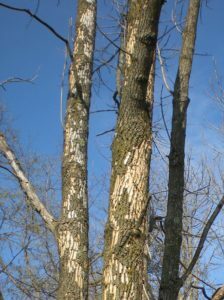 Often, staff encountered trees showing a high degree of stress, or even mortality, which appeared to be linked to the herbicide application. The decision was made to test some herbicide treatments in our nursery to see how stock reacted to the chemical at various rates and application timings, under more controlled conditions than what is typically found on outplanted stock. We selected Dupont Oust XP (Sulfometuron Methyl) as our test chemical, since it is the most widely used pre-emergent herbicide currently in use in Wisconsin.